An 8-0 blowout at the hands of the Cubs wasn’t the worst loss the Milwaukee Brewers suffered Thursday night. To add injury to insult, the Brewers also lost closer Corey Knebel for the foreseeable future. Knebel suffered a hamstring injury in the 9th inning of Thursday’s game. He will be placed on the DL and will undergo further tests on Friday. But based on the way he fell to the ground, the prognosis may not be good. Knebel immediately grabbed his left hamstring and fell to the ground after delivering a pitch to Chicago’s Tommy LaStella. He eventually had to be helped off the field by teammates. The terrible irony is that Knebel was pitching in a meaningless situation. He hadn’t pitched since Saturday, so Brewers manager Craig Counsell was simply getting him work at the end of a lopsided game. Several Brewers players were a little distraught at the site of the injury. There was also immediate nervousness about Knebel’s status moving forward. The injury also comes on the heels of Milwaukee losing three of their last four games, with the Brewers being shutout the last two days. Knebel was not off to a good start in his first three appearances of the season. However, he was an all-star last season, posting a 1.78 ERA. He emerged as Milwaukee’s answer in the closer’s spot, saving 39 games in 45 chances. 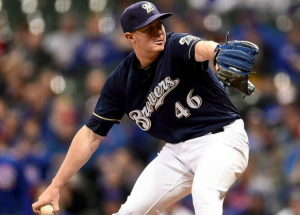 The Brewers were expecting him to continue in that role this season, hoping the 26-year old would continue to emerge as one of the best closers in the league. The Brewers now have to adjust the pecking order in their bullpen. Fortunately, Milwaukee has no shortage of options. Veteran Matt Albers has been the preferred 8th inning reliever this season. Jeremy Jeffress had success as the team’s closer in 2016. He’s also tossed four shutout innings to begin the season. Barnes and Dan Jennings are both competent setup men who could get a tryout in the closer’s spot. Josh Hader could also be an intriguing option. The 23-year old lefty has struck out seven and allowed just one hit in three innings of work early in the year. The Brewers can feel good about the fact that they have a deep bullpen. Milwaukee’s bullpen currently has a 2.01 ERA through seven games. However, losing Knebel was not in the team’s plans for 2018. If Knebel ends up missing a significant amount of time, the Brewers can only hope a reshuffled bullpen can continue to be effective. The loss of Knebel could be massive as the Brewers try to unseat the Cubs atop the NL Central.